Are you the type of person who does their Christmas shopping all through the year to be able to sail serenely through December's festivities? My sister does all her gift shopping by September and by December 1st has everything wrapped and delivered. Really. Its rather depressing. Still, each Christmas I promise myself that I will never again be so last minute, that next year I'll begin shopping well in advance. Well here's a novel idea for your 2015 gift list: jeans that block the ability of cyber criminals to hack into your contactless payment cards or other radio frequency identification (RFID) tagged items. RFID, according to Wikipedia, is "the wireless use of electromagnetic fields to transfer data, for the purposes of automatically identifying and tracking tags attached to objects...". Basically, it is an electronic tag, such as that used in a doggy passport, which contains information - information that is sometimes personal or commercially sensitive. And where there is valuable electronic information, there are hackers. Apparently, RFID tags are widely used across a range of industries. In the case of your ordinary consumer, they are used in contactless payment cards and electronic passports. They are increasingly used in pacemakers and wearable insulin pumps. So the possibility of the information in your RFID tagged items being intercepted without your consent raises major security concerns and some interesting legal questions. If it is increasingly possible for a hacker to access the data on my contactless payment card without me knowing, then what are the potential liability issues of my card provider towards me, and to what extent does this conflict with the provider's statutory obligation to keep my personal data secure? 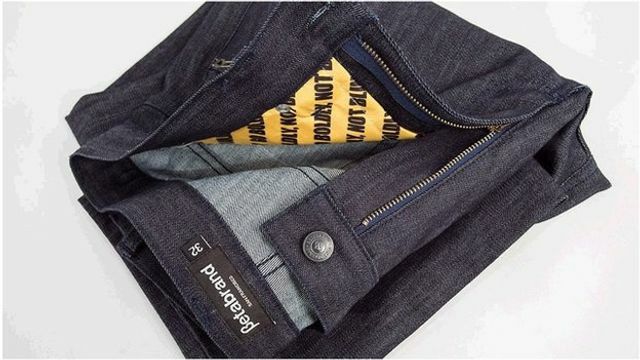 So a company called Betabrand is launching a pair of jeans that claims to prevent such hacking in relation to any RFID tagged items stashed in your pockets. Not much use to women probably. Although there is talk of a men's wallet and bag in the below BBC article, my bet is that a RFID-blocking handbag organiser will be a 2015 best seller if the incidence of RFID hacking is increasing as rapidly as they make out. A pair of jeans containing material that blocks wireless signals is being developed in conjunction with anti-virus firm Norton. The trousers are intended to stop thieves hacking into radio frequency identification (RFID) tagged passports or contactless payment cards. According to security experts this type of theft is a growing problem. The jeans are designed by online clothing company Betabrand and use a silver-based material to block signals. They are due to go on sale in February.